In a little Bible Camp by Fort Smith, Arkansas, I discovered how to sing in 1966. Really sing. Not opera, which is too stagey, and not what happens at most Sunday mornings, which is too polluted by self-conscious inclusive wannabe-oppressed but too whitebread-rich-to-say-so music (few things are worse than hearing and watching mainline priestesses directing the crowd to “celebrate and get down”). No. I discovered true singing in the third hour of the Tuesday night camp meeting, where singing is done to shaped notes, an out-of-tune piano with a third of the 88 ivories chipped off and the rest discolored by age, humidity and a lot of pounding. I discovered that singing is best done, not from the diaphragm, but from a gut that sets the heated air in the lungs close to exploding into the night. It is best done with the phase shift produced by the waving of the funeral home handfans, which were made of those ubiquitous brown romantic portraits of Jesus stuck onto a big long tongue depressor. It is best done, also, with generous ladles of lukewarm water slugged down by a very common cup from the zinc pail in the middle of the room. All that week during the hot days we wrestled in the sand of the grassless lawn after our flannelgraph Bible story, ate fried chicken and meatloaf and mashed potatoes and hot green things with bacony stuff in the early evening, and then preaching and singing. I can’t remember much from the preaching except that there was a lot about Joseph, Moses and David. These old sermons were not afraid to talk about Old Testament stories in the idiom of King James and blood. I remember getting the hell scared out of me, and as I get older, I see more that this was a good thing. Next morning, the sun gleamed golden down on the whiteboard chapel, and into the mildewy concrete-slab basement we ran, whiteshirted, scrubbed necks and ears, waiting, breathlessly, for the afternoon to come when we’d be free to undo all that unnatural cleanness in tag, “country jake” (I forget the rules), peak around the corner (my heart would flail if I played this again), and that district’s brand of hide and seek (I could never understand the rules). We all loved Jesus, and He was real, and we were not conscious of any other possibility, and so we only believed and did not do any meta-thinking about belief. We were also multi-cultural without knowing it. We sang to God without looking at ourselves. I didn't know until years later that I was, that week, a minority of one. We ate, we sang, we prayed and played. But water never tasted so good as that cool stuff, singing, from the silver pail. I’ll know I’m in heaven when the joy of that Day will exceed and restore all that play and the long table dinners, and the songs of forever will complete and fulfill the day when I discovered how to sing for real. Thanks, O., for helping me to remember. This is the Column of Christ's Flagellation, the post of His scourging, the customary place of criminals who suffered for their sins against society, not usually the place of suffering for society's sins, but One Day is was done that way. This is the Column, dark today, of the Son of God, the Second Person of the Trinity, born of the Ever Virgin Mary and of the Holy Spirit, Who did miracles wondrous fair, and fished for mankind, and turned stone into bread, and bread into Eucharist. This is the Column I saw, and peered into, near the Throne. Only a King such as He would take a Column such as this, with anamnetic iconic force linked across millennia to remind us all that only this King would take a Whipping Post, painted crimson That Day, and make it royal, though ebony for the ages. This is the Column I saw and kissed one day, last week, like all days, and knew it was My Column once, and should have been my crimson, were it not for a Son One Day who took me past, with you, through the resolution of Time. At this place in Istanbul, above and beyond to the veil of her, who prays for the City still, as she did for her Son Who stood before this Column of His Flagellation, and our Salvation. From a guide to the Ecumenical Patriarchate, by Fr. 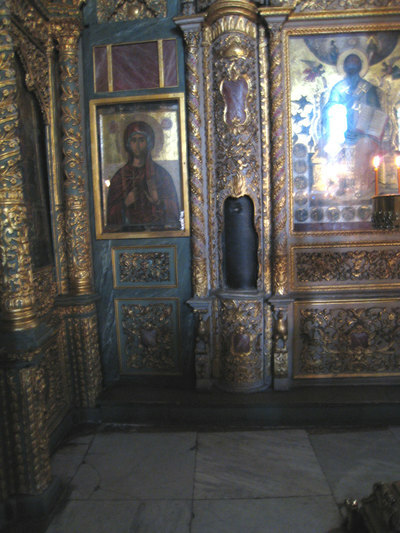 John Chryssavgis: Located in the southeast corner of the nave (of the Patriarchal Church of St. George), this column is one of the most treasured and ancient relics of the Church of St. George. It is a portion of the column where our Lord was bound and whipped by Roman soldiers during His Passion and before His Crucifixion. Two other portions of this column are preserved in Jerusalem and in Rome. It is said to have been brought to Constantinople by St. Helen, the mother of Emperor Constantine, after she visited the Holy Land. In my black leather travel bag of necessities, I carried (or lugged) to New Rome an unnecessarily-tabbed notebook for journaling, in three sections, bon mots from the Conference (joined with less eloquent commendations or refutations). In the third section were scrawled the notes for a little story or essay, whichever form the mass will take. And in the second was for something called “impressions” – that grievous sort of loose unlucid thought released by Proust like Pandora’s box. I think Proust did something nasty to consciousness and its relationship to Time, but I don’t know what. Yet. I’ll think of something. Also pocketed into the strata of paper and nylon dividers was my trusty but cruelly tattered and water-logged Immortal Poems of the English Language, anthologized by Oscar Williams. It is now sheathed by mailing tape ever since it was baptized by a rogue Atlantic wave at Sandbridge years ago. I found Yeats, Byron, and Omar Khayyam to be trustier guides than the party-head stuff supplied by the Lonely Planet (a name, by the way, prophetic of the new third world -- “third,” I mean, in the Rieffian sense, not in the warm fuzziness of the United Nations). Along with these were my volume of The Hours of Prayer (my diocesan book of canonical devotions); and, signaling my attempt to be current on things Istanbullian, Orhan Pamuk’s book, eponymously entitled The Black Book. A book which shall join many others on my shelf, glaring at me with reproach for having failed my vow to better my cosmopolitan sensibilities. Lastly, the shabbiest of my bibliographic companions was The Path to Rome, by Hilaire Belloc. I took this wretchedly-edited book (the hardpress.com edition, if one can burden the word “edition” with such a bankrupt accident or particular manifestation as this instant) because I thought it diverting and gnomic to read of his path to the old Rome, whilst I wended my way to the New. Laying aside, for a short while, my complaints about the illiterati at hardpress.com (what is meant here by “hard”? ), I look now upon the scraggly lines of blue and unfortunate pink (I took up this cursed highlighter over the Alps when the blue ran out) that have overlaced the pages of my now-favorite interlocutor. Providentially, the second half of Chesterbelloc prepared me well for Constantinople. It is good to cathect, or interject, the images of geography into memory, as the soul needs these solids to ride on and to reside in. That is what travel does, from place to place: it breaks the constant temptation to stop, fantasize, and demonically fabricate one’s own little Hadian world. This is why little pilgrimages are needed, even if one only went to Church on a Sunday, because his own mundane procession of images and feelings are not really home, but a sedimentation of falsifications. Travel is needed, pilgrimage is called for, to go to a difference and a sacrament, to grasp the stuff of Time, and thence to return, to achieve Home, for pilgrimage is only and ever a story of Homewardness, never merely a soliloquy of musing outward-bound. What is it, do you think, that causes the Return? I think it is the problem of living; for every day, every experience of evil, demands a solution. That solution is provided by the memory of the great scheme which at last we remember. Our childhood pierces through again … But I will not attempt to explain it, for I have not the power; only I know that we who Return suffer hard things; for there grows a gulf between us and many companions. We are perpetually thrust into minorities, and the world almost begins to talk a strange language; we are troubled by the human machinery of a perfect and superhuman revelation; we are over-anxious for its safety, alarmed, and in danger of violent decisions. There was to be no more of that studious content, that security in historic analysis, and that constant satisfaction of an appetite which never cloyed. A wisdom more imperative and more profound was to put a term to the comfortable wisdom of learning. All the balance of judgment, the easy, slow convictions, the broad grasp of things, the vision of their complexity, the pleasure in their innumerable life – all that had to be given up. Fanaticisms were no longer entirely to be despised [blogger note: now that’s something to be swallowed, like asafoetida, by neo-Christian euro-academicians], just appreciations and a strong grasp of reality no longer entirely to be admired. Yes, certainly religion is as tragic as first love, and drags us out into the void away from our dear homes. Airports are not at all like the ports at sea used to be. Now those were proper ports, sandwiched by a long storied journey on the starboard side (a journey that ran rather much as a decent narrative should), and on the other port side, an unknown amorphous tale of the future, chaotic and psychically void (except, of course, for the eschaton). In the port itself is an interval, where farewells are made to the sea, and wagons are loaded for land. One stops, breathes, sets down to a table of conviviality (an unknown word these days), trades if he must, and goes to the library for maps. We passed through a succession of airports, which -- like so many things these days -- are not like their types. Ataturk Airport in Istanbul reminded me more of Monroeville Mall than Turkey: it is an icon of what some people in Turkey would like Turkey to be -- certainly they do not want it to be Byzantine, because that milieu is shot through with Christianity; and they do not want it to be Ottoman either, because that is simply too Islamic, and it is contrary to the faddish finance Euro-capitalist myth (I like my rich people to be honestly aristocratic and simply despotic, like a pasha bey, instead of bloodless individuals who hide behind holding companies and portfolios). Charles de Gaulle, somewhere (we were told) near Paris, also looks like a mall in its better moments. We swept through on Monday in one of those. Near our gate was erected a new ageish orange-pink cloud of Big Sur non-music caramelized with wafts of Chanel No. 5: this I noticed as I wandered into the men's room, whose sinks were mere dimples in the white corian, framed by silver statuary that emitted lukewarm water, hot air and pink detergent if you waved your hands in the proper occultic manner. On the other side of Charles de Gaulle, the side we entered the previous Tuesday, the side in construction -- i.e., the side populated by devils and blueprinted by Kafka -- there was, you might say, nothing pink or corian. Pittsburgh International is a proper airport, because it has, standing side by side, statues of Franco Harris in a Steeler uniform, and George Washington in his French and Indian War British uniform. Pittsburgh doesn't deny that it is an airport, and it embraces its cute pledge to welcome everyone into the most livable city. I saw nothing of Paris. I believe this is customary of layovers in Charles de Gaulle. For irony's sake, I sent 2 postcards home: one of the Eiffel Tower and the other of the Arc de Triomphe, if only to show what I did not see. It is possible, for all I know, that Charles de Gaulle is nowhere near Paris, but is still in New Jersey. I did not need to see New York on this trip, though I really like the place. I live in Pittsburgh, and I love my home. But this little essay is not about home, but about a destination. It is about Istanbul, or, as some of us sentimental church-besotted cranks like to call it, Constantinople. My ten companions and I (one of them is my 18 year old daughter) did not go to Constantinople for a pilgrimage, so I cannot frame the story of our journey, or any of my reminiscences, in the classic terms of peregrination. We traveled to a conference, and a Youth Conference at that. You, fair reader, must know by now from wading through the tide pools of these posts, that I am not at all a good Conference attendee. I get drowsy too much, and my head nods to the rough procession of iambs and dactyls of fairly decent, but sometimes howlingly funny, earphone translation. One can see the author himself in the soft grip of Morpheus: our can-do diocesan webmaster thought it was a moment of profound reflection -- my family knows that this is an impossibility by definition. My companions and I went to Constantinople to receive the blessing of his All Holiness, Ecumenical Patriarch Bartholomew, and to see the cradle of the seven ecumenical councils. We went to meet Orthodox Christians from around the world: Greece certainly (and predominantly), but also Brazil, Australia, England, Germany, Finland, Estonia, Belgium, France, Ukraine and the Bahamas. And we went to see the ruins. Some were ruins in states of decrepitude. Others were ruins in states of defacement. Hagia Sophia was a ruin with both. I wanted to run into Hagia Sophia on Sunday afternoon and kiss the stone floor of the nave. I was prevented, of course, by the press of the crowd, and by Khalil, who insisted, before we got in, since he was the guide of the 5000 people in my guidance party, on telling us all what an icon was. I told my daughter, who with me might never see Byzantium again, that I could tell her myself what an icon was but didn't need to since she knew that sort of thing from infancy, and that we might as well take ourselves on our own tour, so we escaped into the sacred space of Justinian, who used the stones that used to echo the holy complaints and fire of Chrysostom. We stepped out by the scaffolding, under the calligraphically encrusted dome, and heard the echoes of contemporaneity silently fall to acoustic velvet in the dark, beautiful sorrow. Wisdom, I whispered, let us be attentive, I wondered, peace be to all, I remembered, in fear of God with faith and with love, I came forward to the ancient solea, and imagined the nine hundred years of faithful who became each one an icon of Christ, because they received Him in faith and substance, and passed starboard into the future of the world. Hagia Sophia is an old proper port. The famous image stands, still, of Christ flanked by the Theotokos and the Forerunner, they in supplication, He in grace. The icon, as you might know, has been stripped away, though the Faces remain. The Patriarch, too, still stands in the Phanar: he calls the situation of the See of Andrew the "Crucified Church," and it is. During the Conference, I remember a passage of mind, in which I thought, "Well, now, if he wants to stay under the Turkish yoke, and if he rejects the thought of gold and power when other potencies call him deficient, then I will no longer pray for his removal to New York, but will pray with him and for him in his place." My Patriarch rules from under oppression. He has no country, no flag, a little throne. There is no worldly reason for the other patriarchs or hierarchs to answer his call. The Empire lies in ruin: he remains. His throne, like Hagia Sophia, might be defaced. But it is still, like Christ in a new third and deconstructed world, in place. Do not make excuses ... say simply, "I was wrong," or "Forgive me, I sinned against you"
See you in a fortnight, back -- God willing -- from New Rome.